In this post we will be discussing the Windows visual effects under the performance settings and how to automatically apply them. Windows performance settings allow you to tweak the visual aspect of your desktop to either improve it visually or speed up its performance. 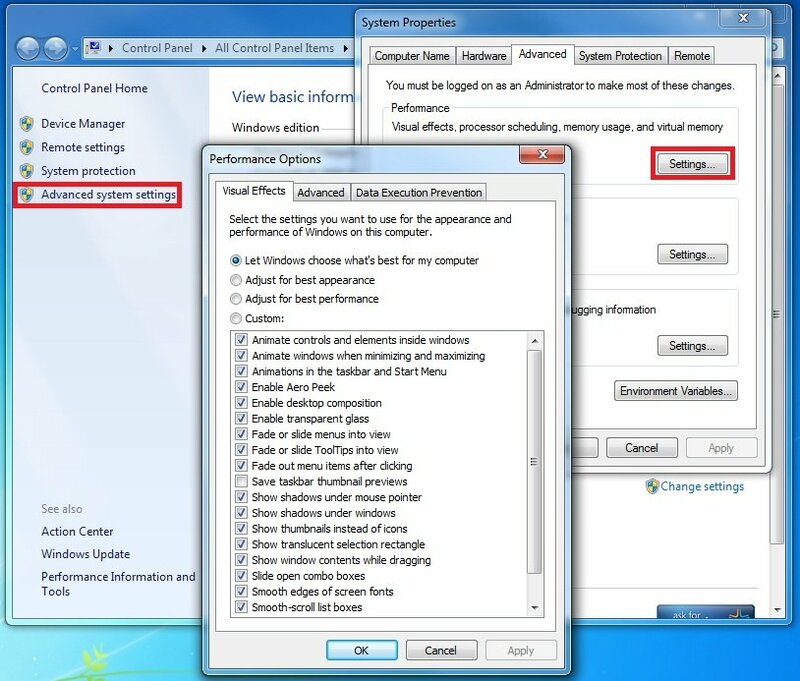 If you aren’t aware of these options, click right on Computer and select Properties, click Advanced Setting, under the Performance section select the settings button as shown below. Q1. Why would you want to change these setting? A1. In my case I use these setting to increase the performance of a VDI session over high latency Internet links. Disabling these options reduces how much is refreshed on the screen when receiving a PCOIP connection from VDI remotly. Q2. Why would you want to automaitly set these options? A2. As mentioned, VDI is my main use for these options and unfotunanlty you cannot pre define these option on on a per desktop basis. These options are reflecedt on a per user basis meaning if i login to a machine and turn off all visual effects options the log out. The next person that logs in will also have to set these options as there are defined in the users local profile. unfortunanly redirected profiles do not carry these options. As with a VDI enviroment you cannot expect every user that logs on to modify there own settings for best performance, i needed a way to automate this. To do so i created two registry files that apply the correct setting on logon and log off. Sadly not all optiosn apply from a simgle execution of thye script. The way i managed to do this was by creating a batch scprit to pull the registry files from a file share and apply them through a login script assigned in group policy. Simple but effective. 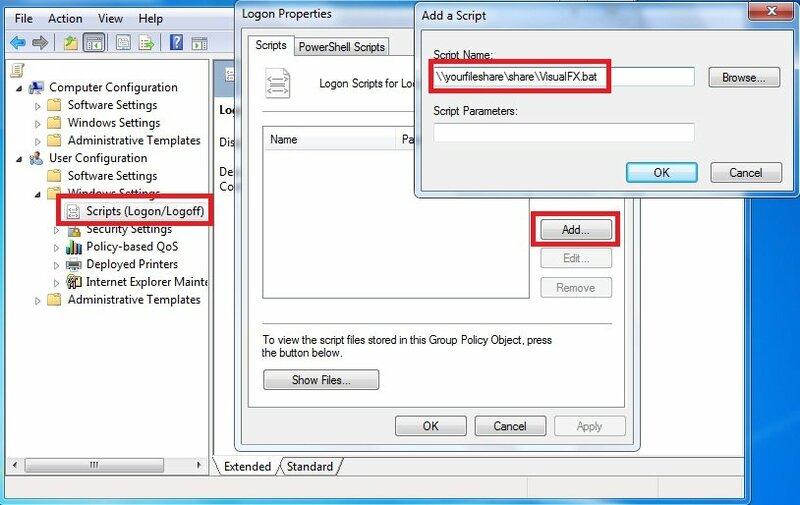 User Configuration > Windows Settings > Scripts (Logon/logoff). Double clike this item and click Add then enter the path to the batch script including its extention. See below for me detail. I would rcomment adding this as both a logon and logoff script to minimise the number of logins a user has to perform. With both logon and logoff set, a single login / logout will fully apply the changes. Thanks for reading and remember to lookout for future posts on perfromance tweaking.